Walked us through each step of the process. Tonya was great! Walked us through each step of the process. It was a pleasure doing business with you. Everything went as promised. Melissa did a fine job. Thank you. ...within two days I had a new customer. I can say enough about the super quick response time and professionalism by Stacy Sweet. He sent me a lead. I followed up and within two days I had a new customer. In this industry, new qualified leads are hard to come by but Stacy and his team makes it so smooth for all parties. I highly recommend all vendors to contact Stacy and he will help you grow your business!! Stacy, what can I say.You were very helpful and patient with me on my first vending route purchase. I was amazed at how smooth my transaction went. 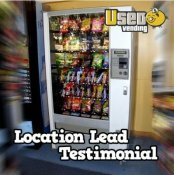 Thanks for the excellent customer service, I'm glad I chose USEDVending. I have had the pleasure of listing and selling 2 machines with Melissa. She is top notch in getting the job done in a very efficient and professional mannner. I have been in the vending business for 33 years and would highly recommend her services and expertise. It was a pleasure dealing with April.I thought I was dealing with a person I've known my whole life.She was extremly helpful and I thought I was buying a vending machine from a family friend. When I needed a secong machine I called april only, because I knew she would give me the best price. It was a real pleasure to deal with April.